Molecular clusters, in the broad sense that the term is commonly understood, today comprise an enormous class of species extending into virtually every important area of chemistry: "naked" metal clusters, transition metal carbonyl clusters, hydrocarbon cages such as cubane (C H ) and dodecahedrane (C H ), 8 8 20 20 organometallic cluster complexes, enzymes containing Fe S or MoFe S 4 4 3 4 cores, high polymers based on carborane units, and, of course, the many kinds of polyhedral borane species. So large is the area spanned by these diverse classes that any attempt to deal with them comprehensively in one volume would, to say the least, be ambitious-and also premature. 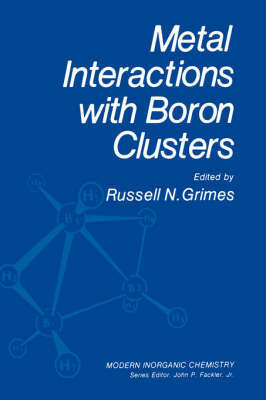 We are presently at a stage where intriguing relationships between the various cluster families are becoming apparent (particularly in terms of bonding descriptions), and despite large dif- ferences in their chemistry an underlying unity is gradually developing in the field. For example, structural changes occurring in Fe S cores as electrons are 4 4 pumped in and out, in some measure resemble those observed in boranes and carboranes. The cleavage of alkynes via incorporation into carborane cages and subsequent cage rearrangement, a sequence familiar to boron chemists, is a thermodynamically favored process which may be related to the behavior of unsaturated hydrocarbons on metal surfaces; analogies of this sort have drawn attention from theorists and experimentalists.